"Trend Sound Promoter AMG Corp, sponsored by Alliance Media Group, presents TSP ad-promoting platform designed to promote artists, performers, and different types of businesses online. Our online marketing tools enable our customers to reach millions of Internet users on a daily basis. The goal is to continuously expand our large distribution network, to constantly generate new clients, increase daily website traffic, and help any business grow." 1. Thousands of Independent promoter – distributors who promote your business through TSP as well as their friends and family are your potential customers. 2. Our promoters utilizing approved email databases and share information with thousands of people from all parts of the world about your products and/or services. 3. As an advertising partner of TSP, you can purchase guaranteed traffic packages. Each package has a preset number of visits (impressions) that you can receive to your website. This traffic comes from actual people who can become your customers. We use these and other effective online marketing techniques to help your company gain massive exposure." TREND SOUND PROMOTER AMG, CORP.
What is Trend Sound Promoter? And just what IS their "ad market place"? 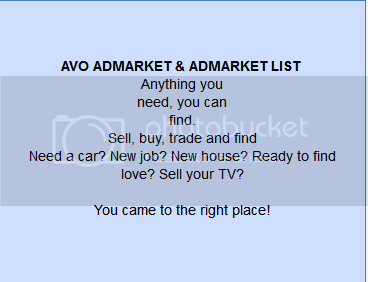 "AVO Advertising and Free Classifieds"
AVO AdMarket & AdMarket List - advertising and FREE classifieds. Sell, buy, trade, and find work or workers with us! This page claims Pigida has a long history of spamming, but doesn't provide any supporting documentation. and you'll soon discover its' virtual office suites. "Our exclusive Advertising Partner is the Soundtrack Studio LLC, recording and media Production company offers valuable services to musicians and artists. (click here to learn more)." "P12000099787TREND SOUND PROMOTOR AMG CORP ADOMP 601 108TH AVE NE 1900 BELLEVUE 98004 601 108TH AVE NE 1900 BELLEVUE WA98004 11302012 N FL PIGIDA VOLODIMYR P P989 112TH AVE NE BELLEVUE FL98004 P PPIGIDA VOLODIMYR P 989 112TH AVE NE APT 1805 BELLEVUE WA98004 "
Again, that proves nothing other than they registered the company. Note: No evidence substantiating the complaint is provided. 6 pages of comments posted on MYWOT within a 5 day period - yeh...nothing fishy about that. So they were able to track the IP and "the people involved"? So multiple people were attacking from the same IP? I guess they were all sharing the same proxy. lol. How clever of them. Not long ago, my sister Anetta came over with her husband and bragged about their new business which has been the answer for all of their issues. A friend of theirs, in church, has introduced them to a new company, called Trend Sound Promoter (AMG). It is supposedly an ads platform, which allows anyone to make easy money by sending out email. You simply create an account on trendsoundpromoter.com and send them out, one by one. The company guaranteed to pay an unbelievable $0.40 per email that you send out, because they have so many companies who are paying them money for that. I started research into the company and within hours, came to see that we are dealing with one of the biggest scam companies. Just to make sure I am not mistaken, I've shown the website to two of my friends, who manage the marketing department for Amazon Local and Amazon Fresh. It took them minutes to point out the many inconsistencies and sickening lies of Trend Sound Promoter. Both of them have affirmed that it without a doubt a nasty scamming company. They require you to buy before you make money. No major ad marketing company requires money upfront. Not even Google AdSense. Impossible to earn $0.40 for each email. An average price for a single impression (to have your ad viewed) is $0.013. An average price for an email impression (to send out your email, but not guarantee a click) is $0.0035. That is because many emails are automatically sent to Spam box, many are blocked and the probability of people clicking is much less today than it was. So, to say that some company will pay $0.40 an email + another about $0.40 to Trend Sound Promoter, for their commissions is unreasonable and stupid, when the average price is $0.0035. The most you can get paid for manually sending out the email is $0.0014 (50% goes for company earnings, more goes for email server hosting, more goes for expensive and unblocked ip addresses). I went to one of the hosted meetings and had a chance to meet the sales employees of the company. What surprised me, is that none of them understand how ads work in real life. They said that by sending out email addresses "one by one", you are sending "Live Clicks" to the company. First of all, there is no such thing as "Live Clicks", just Google for it. Second, if there was such a thing, then you would be "faking" the clicking on ads, therefore fraudulently making money. Third. It's not digitally possible to send any "Live Clicks" over. It's the same computer, who is sending out email addresses. It doesn't matter who clicks the "Send" button, because at the end of the day, it's the same computer that sends out the email. They do not actually send out any email. This one you can try testing yourself. It took us 13 tries, before it worked for us. This method you can check if you have an actual account with Trend Sound Promoter. Before sending out the email, open the source of the page (Ctrl + U). Look for the email address that you are sending out to, it will look something like somename35@hotmail.com. Go to the email provider and see if you can register that email address. Because many of these email address are old and many do not exist, you can register the email address, before sending out the email through Trend Sound Promoter. Register that email address, and go ahead and send the email from Trend Sound Promoter. You will see that Trend Sound Promoter does not output any emails, whatsoever. They have no actual customers. Their only clients are fake companies, created by themselves. If you still go ahead and add all of those clients, they still don't account for 95% of work they claim to be doing. Most ad marketplaces have a section to their website with a list of actual clients. On the bottom of trendsoundpromoter.com's website, they have a list of their clients, including Lowes, Hilton, Sears, LG, Delta, Costco, Rolex, etc, are fake. None of those companies are the actual clients of Trend Sound Promoter. They started less than a year ago. Their domain and business name were registered less than a year ago. They have no clue how ads work. Trend Sound Promoter, in its descriptions, uses incorrect terminology, when referencing to the ad market. Terms like "ad platform" instead of "ad marketplace" or "live clicks" (what the heck is "live clicks", theoretically all clicks are live! ), they use the words "per click" instead of "per view" and use the words "per view" instead of "per impression". Shows how illiterate they are in this business. Do you ever see real Ad marketplaces do this? They fake their online presence. Company owner (Volodimyr Pigida) has a long history of spamming. If you know his personal phone number, beginning with (509) 342-****, just Google it. Volodimyr Pigida has been an online spammer for 6 years. You will see him trying to sell stuff to people and him being banned from many public forums. He tried hiring people without paying them and encouraged people to invest their money with him. They make you click buttons so you feel like you are working. Did you know that you can have these emails sent out without doing anything? Just Google for Record Mouse Clicks. You can set your mouse to click on it's own. But they don't want to tell you this, because they actually want you to move that mouse physically, as if that actually makes money. They use old, abandoned email addresses. This step is harder to check. If you have an account, check the source of the website page where you are sending out the email (Ctrl + U). You should be able to see the full email addresses you are sending out to. Now Google it. When I Googled, I found that these email addresses come from a 10-15 year old, list of "harvested" email addresses, which anyone can buy. Harvested, meaning that they were crawled and picked up by bots. I have called FBI and many news agencies to report Trend Sound Promoter. What shocks me the most, is that regardless of so many attempts to tip off the authorities, FBI does not go about doing anything about such a crime. Does anyone think there may be some funny business going on with the Trend Sound Promoter domain registration, perhaps ?? If it the same Vladimir Pigida (Владимир Пигида) as of TVI Express travel agency scam. He is wanted in republic of Belarus. Hmm. Definitely worth the time to look into. Thanks. I checked, the Belorussian TVI Express leader with the same name is not him. A Belorussian is paranoiac now, you would be if if you are wanted and your name was mentioned in news. Secret world government, the Illuminati and Zionists hunt for my personal data. I'm going into hiding.